Composer Nicolas Panagopoulos works on the graphic score for one of his compositions. As composers in the mid-20th century began wild experiments in sound, the practice of traditional music notation became increasingly inadequate. How, for example, could the sound of John Cage’s amplified cactus, or the electroacoustic experiments of Pierre Schaeffer be effectively scored by notes on a staff? As a result, the art of graphic notation — the use of shapes or patterns instead of, or together with, conventional notation — began. The scores generally fall in one of two categories: Some strive to communicate specific compositional intentions, while others are meant to inspire the performer’s imagination. Here’s a look at a few graphic scores, the ways they’ve been interpreted by performers and how the tradition has evolved over the years. The first of five Projections were composed between 1950 and 1951. Feldman’s piece was inspired by both the spatial compositions of Edgard Varèse and the abstract visual art of his friends Mark Rothko and Philip Guston. The score falls into the category of suggesting specific musical ideas. Composed on graph paper, Feldman’s series of boxes and symbols give direction about tone color, note duration and basic tempo, while the actual pitches performed and other musical subtleties are left to the discretion of the performer. Cornelius Cardew’s studies in graphic design are evident in Treatise, a 193-page score of abstract symbols that give no specifications to performers. 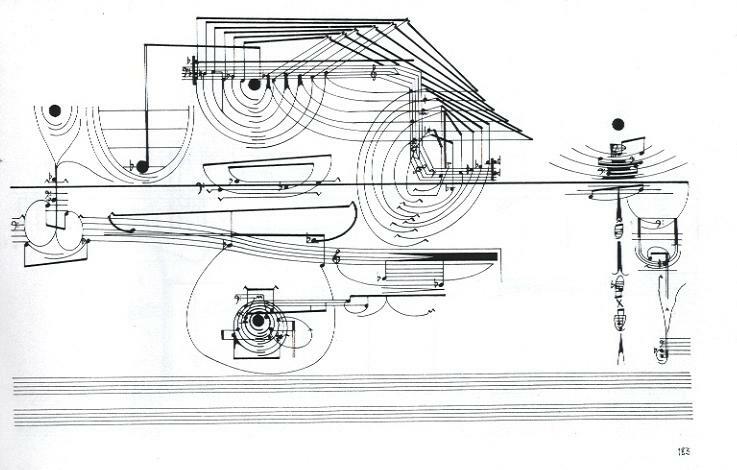 Any number of musicians, using any instrument, can interpret Cardew’s score how they see fit. Perhaps suprisingly, the biggest critic of Treatise was Cardew himself. In the late 1960s and early 1970s, having embraced Maoism and communist ideals, Cardew publicly renounced — and gave a brutal indictment of — his earlier, indeterminate works. For Cardew, only tonality and traditional music notation could serve the political movement he advocated. Below are two very different interpretations of excerpts from Treatise. The score most associated with Artikulation wasn't actually created by its composer György Ligeti. Instead, it was graphic designer Rainer Wehinger who created the score in 1970 — 12 years after Ligeti had composed the piece. Wehinger’s “listening score” is fascinating to follow, and it gives listeners a point of access that they might not otherwise find with Ligeti’s challenging work, which was originally scored by the composer with copious amounts of graphs and charts. American singer Cathy Berberian worked extensively with other experimental artists, performing and interpreting new works from John Cage, Igor Stravinsky, Darius Milhaud and Luciano Berio, to whom Berberian was married from 1950-1966. In her own composition, Stripsody, Berberian delightfully employs onomatopoeia and comic strip sensibilities, lending a lightheartedness that can be hard to come by in the often über serious avant-garde style. Beginning her career as a classically trained oboist, Nashville-based artist Robbie Lynn Hunsinger became interested in experimental music after performing the music of Varèse and Messiaen under Pierre Boulez with the Chicago Symphony. Her latest work, Constellation, was created as part of the 2016 Metro Arts Learning Lab. Utilizing her skills in technology, coding and game hacking, Constellation is an interactive audiovisual project that allows participants to manipulate graphics and create a custom soundscape. You have the chance to dive into the piece yourself. Hunsinger will be exhibiting Constellations on June 24th at the Nashville Pride Weekend Block Party and June 30th as part of the INDIVISIBLE Independence Day Celebration at Conexión Américas. Now that you get the gist, you might want to play around with creating your own synthesis of music and graphics. Patatap.com is an animation and sound kit, pairing graphic visuals with various noises. Simply use the letters on your keyboard to compose an avant-garde composition; pressing the space bar toggles between moods and collections of sounds. Just a heads up: this website uses some strobe effects, and typing quickly may be over stimulating for some users. You can also peruse Youtube for beats and music shared by other Patatap experimenters. You have a few more days to catch “The Dada Effect: An Anti-Aesthetic and Its Influence” at Vanderbilt’s Fine Arts Gallery before it closes on May 27th. The exhibit explores the rise of the artistic movement in the wake of WWI, when Dadaists gathered to forge an anti-establishment, anti-bourgeois and anti-war philosophy that rejected conventions of the past. Each summer, talented high school students from around the state gather in Murfreesboro to hone their visual art, theater, dance or music skills with college-level teachers at the Governor's School for the Arts. We got a taste of how much fun the faculty get to have, as professors from the music division performed lively selections together with their peers.